I love accessorizing all my outfits with jewelry. I feel so incomplete without having any on. 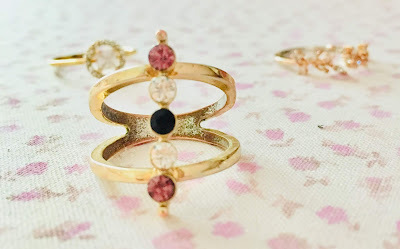 Today I wanted to share with you what jewelry I've been wearing throughout this Spring. 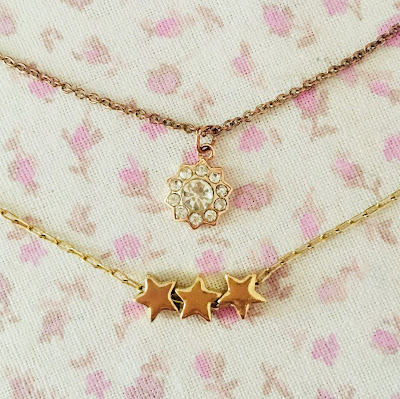 I love delicate jewelry especially for my necklaces. Their perfect for an everyday basis. If your wearing a bold outfit sometimes you don't also want bold jewelry. You want something more understated and simple so it doesn't take away from your outfit. Don't get me wrong I also love statement necklaces but I usually go for more delicate, simple jewelry. 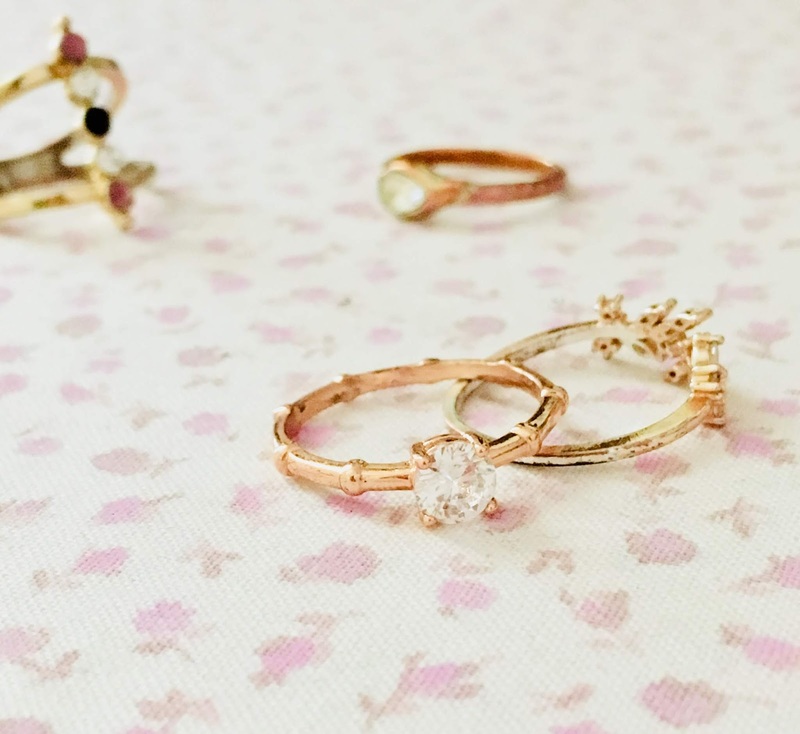 One of the best parts about wearing delicate jewelry is that you can layer them. It looks so pretty and stylish. Juicy Couture and Forever 21 have some great delicate jewelry. 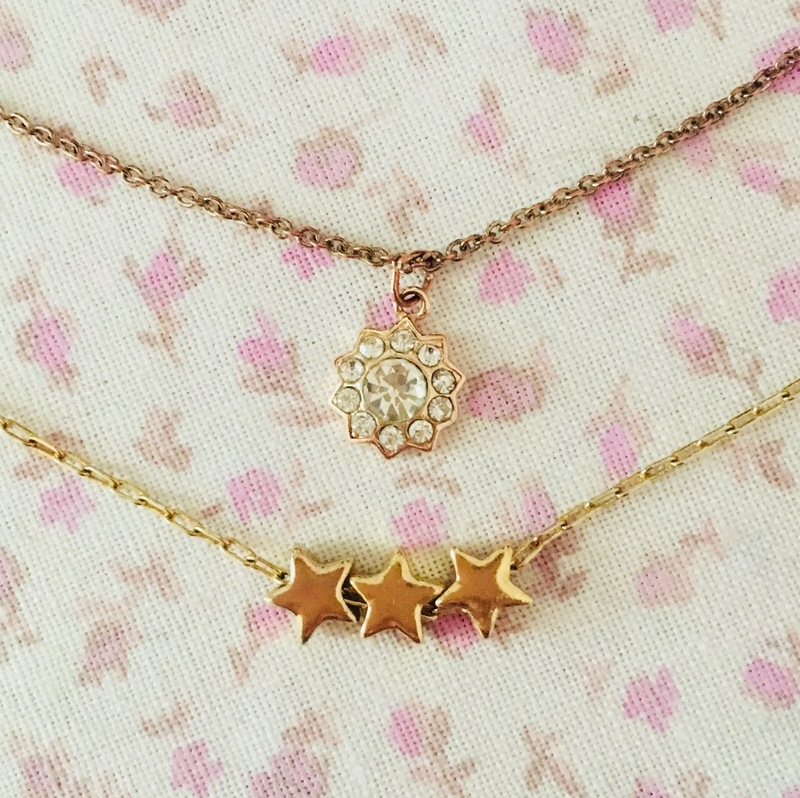 This star one is from Forever 21. 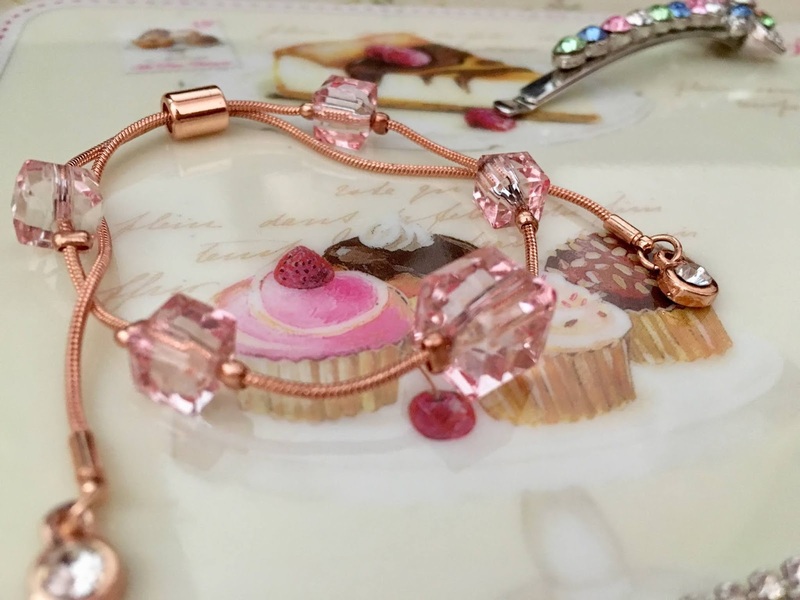 I've been loving the types of bracelets that you slip on and pull to your size wrist. My wrists are very small so it's often hard for me to get bracelets that fit me right. They are very comfortable to wear and they look amazing. Charming Charlie has so many beautiful jewelry pieces, especially their bracelets. I love this one I've shown on my blog before with the pink cubes in this post. 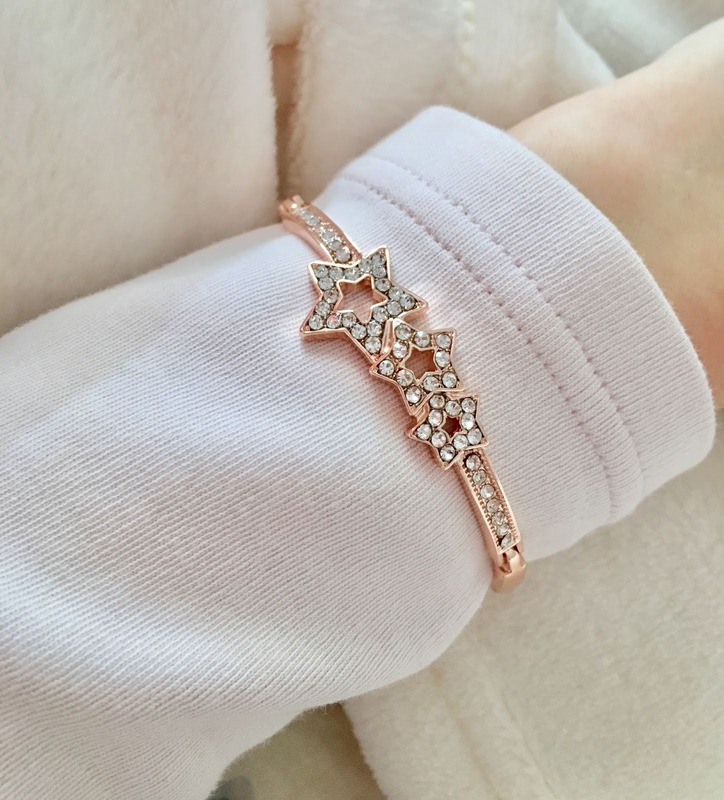 This rose gold star one is also from there. Earrings are so important to me. I love stud earrings when I want more of an effortless, casual look. I wear earrings every single day even if I'm wearing a casual outfit. Sometimes it looks a little odd if your wearing a necklace or other jewelry with sweats or an over-sized top but not with earrings. Studs are my go-to earrings. 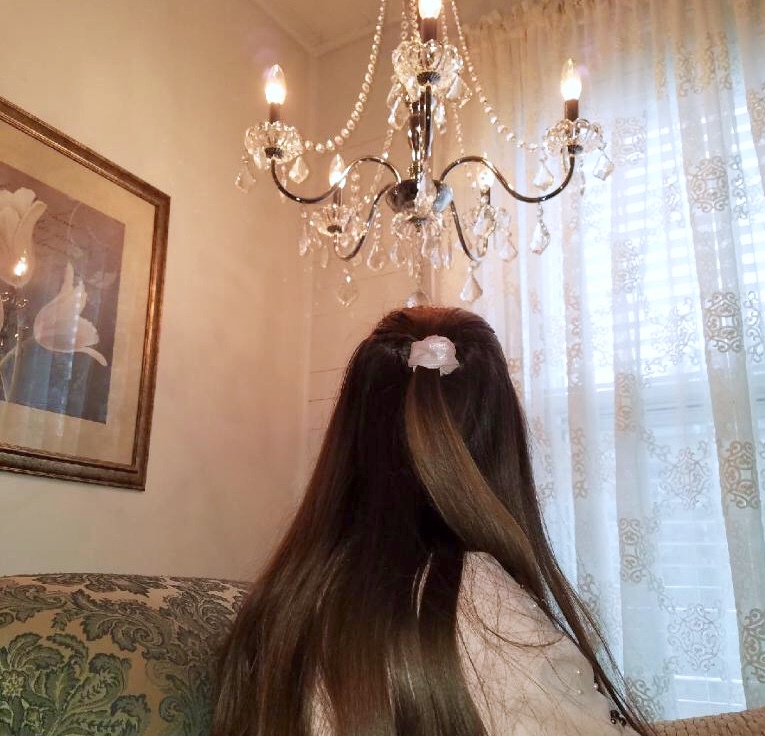 I wear dangling earrings when I have an occasion or am more dressed up, they look so elegant and chic. 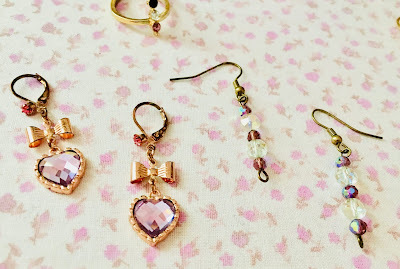 I adore these rose gold heart Betsey Johnson ones I got a few months ago! I did a post on them here. 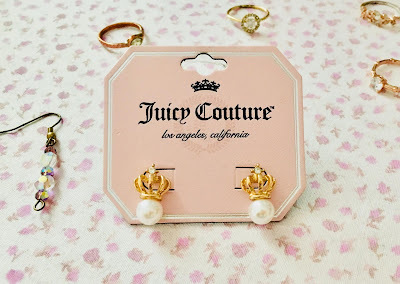 These Juicy Couture pearl crown earrings are also to die for! I've recently gotten more into rings. I used to not wear them as often as I do now. I constantly am wearing rings. This may sound silly but I think rings make your hands look so lovely, almost like nail polish. They "dress up" your hands. I feel so much more confident if I'm wearing rings or my nails are done. As I've probably said it a million times in my posts but I have an obsession with rose gold. So majority of my rings are rose gold! This has been the pieces I've been wearing for Spring this year. If you could only chose one piece of jewelry (necklaces, bracelets, earrings, or rings) to wear what would it be? Please share this post!